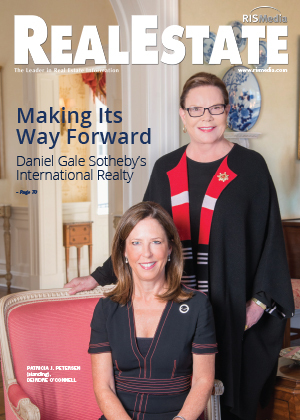 Since its founding almost 100 years ago in Huntington, N.Y., Daniel Gale Sotheby’s International Realty has grown to become one of the Long Island region’s most significant residential real estate organizations. 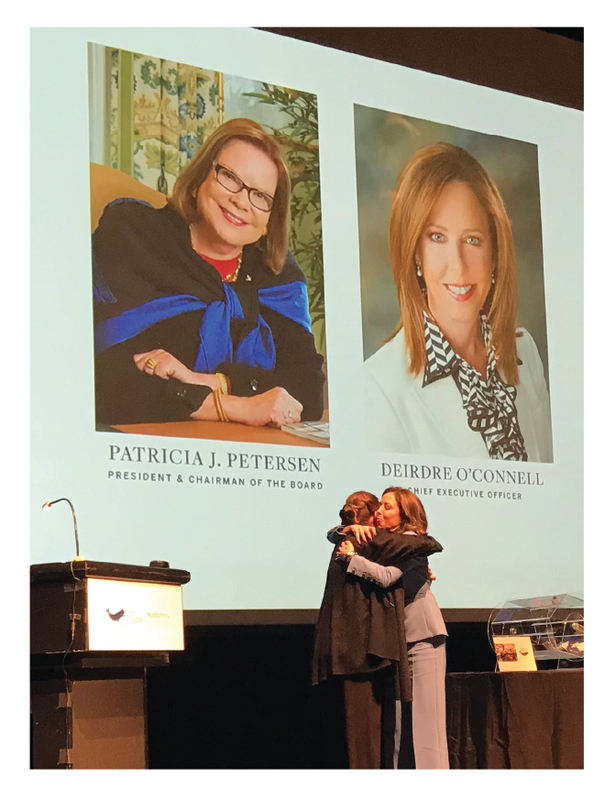 Much of the credit for its continued success through many decades of economic growth, industry changes, demographic shifts and the more recent technological revolution rests squarely with Patricia J. Petersen and her extraordinary management team. While many real estate organizations that began as a family business—much like Daniel Gale Sotheby’s—have either closed their doors or folded into a much bigger company, Daniel Gale Sotheby’s International Realty has forged its own path, opening or acquiring offices in desirable markets and developing strategic relationships enabling it to persevere and flourish, regardless of market conditions. 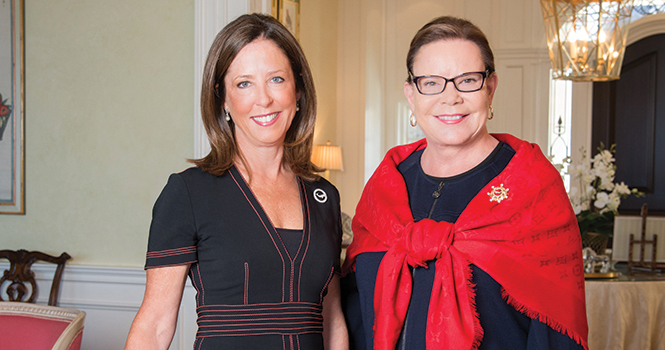 Following the organization’s most successful year in its history, Pat Petersen stepped aside as chief executive, naming her second-in-command, Deirdre O’Connell, as her successor. The transition in the CEO role was announced at the annual company-wide meeting in front of an audience of close to 1,000 agents, associates, friends and family. Petersen announced O’Connell’s assumption of the CEO role at the organization’s annual company-wide meeting in February, along with a few other announcements that more than demonstrated that Petersen’s last year as chief executive was a busy one. In 2017, the Daniel Gale Sotheby’s International Realty organization achieved $3.3 billion in sales volume, closed 3,590 units and maintained an average sales price across the organization of $912,000—almost twice the MLS average on Long Island. As further proof of its leadership in the luxury market, Daniel Gale Sotheby’s International Realty closed more than double the number of transactions above $3 million than its nearest competitor. As if the announcement of a new chief executive was not enough of a change for the future, Petersen also unveiled a powerful new branding campaign for the venerable organization: Your Way Forward (#yourwayforward). 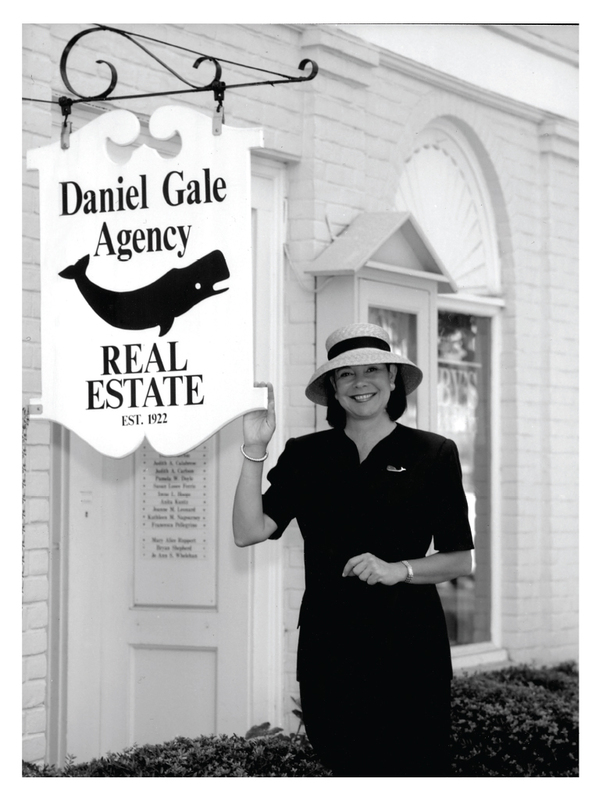 Patricia Petersen outside Daniel Gale Sotheby’s Cold Spring Harbor office circa 1980. While Petersen has handed over the day-to-day oversight of the organization she helped build, she will still play a major role in the strategic direction of the organization as president and chairman of the board. Recently named to the SP200 (Swanepoel Power 200), Petersen joined Daniel Gale Sotheby’s International Realty as a sales associate in 1974, and right from the start was a success story, growing her own business as well as that of the firm. Working with real estate icon D. Kent Gale, the two visionaries plotted a course for Daniel Gale Sotheby’s International Realty that grew the company from two sales offices to a half-dozen, and launched a relocation department when no other agency had one—followed by a new construction division and an agent training program that was among the most comprehensive and highly regarded in the industry. The pair formed alliances and recruited top agents, allowing them to venture into new territories and ultimately acquire competitors that shared the same high standards of professionalism and integrity. Over the years, Petersen assumed managerial roles of increasing responsibility, leading to her elevation to president and CEO in 1990. Like O’Connell, Petersen was hand-picked by the executive she would succeed—in her case the late Kent Gale, whose leadership of the organization spanned 40 years. In a career defined by a keen vision and market savvy, perhaps Petersen’s boldest and most rewarding move took place in 2005 when she reaffirmed and renegotiated a decades-long association with Sotheby’s International Realty (SIR), which at that time was changing its affiliate model. Petersen saw the long-term value in the affiliation—certainly for its formidable brand, but also early on recognized the growing value in, and need for, increased exposure to a national and global audience through the extensive worldwide marketing, referrals and networking that only Sotheby’s International Realty could offer its affiliates. Daniel Gale Sotheby’s International Realty has been a Sotheby’s International Realty affiliate since 1976, and finished 2017 in SIR’s Top 5 based on closed sales volume. The firm services a region spanning 108 miles from NY Harbor to Shelter Island. Today, as O’Connell takes the reins at Daniel Gale Sotheby’s International Realty, its marketing prominence is visibly demonstrated by the prevalence of its iconic whale logo on For Sale signs across Long Island and Queens. Its brand is backed by a powerful team of some of the best real estate professionals in the industry delivering incomparable service to their clients and customers, both at home and abroad. Close to 1,000 people in 27 offices carry a Daniel Gale Sotheby’s International Realty business card, serving the real estate needs and investments of hundreds of different communities spanning 108 miles throughout Nassau and Suffolk Counties, Queens, the North Fork and Westhampton Beach. While Daniel Gale Sotheby’s International Realty has grown tremendously in the past two decades, it continues to embrace the supportive family feeling that has long defined its culture. In selecting O’Connell for the CEO role, Petersen looked to someone who was widely respected both within the organization and throughout the industry as a hands-on, approachable and visionary professional. A highly successful salesperson and gifted sales and regional manager, O’Connell came to Daniel Gale Sotheby’s International Realty in 2007 after having built a successful start-up real estate agency in one of the most competitive markets on Long Island: Manhasset. 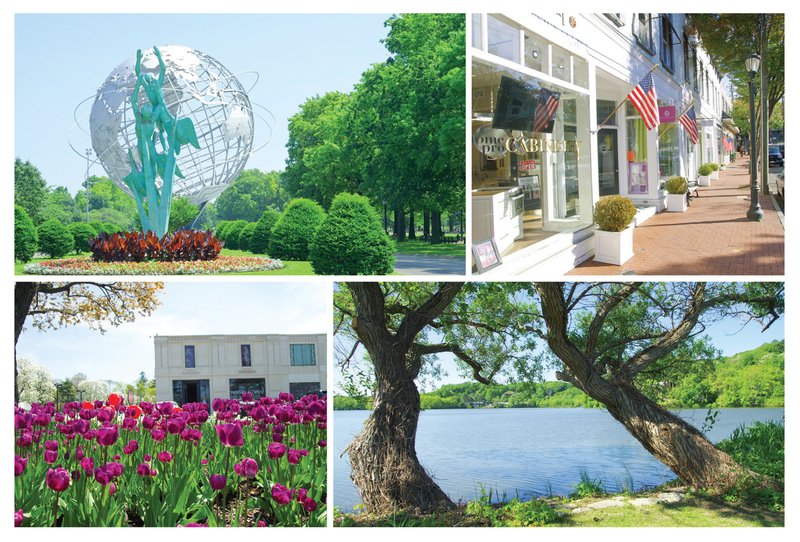 As that office gained traction and grew increasingly successful, O’Connell opened a second office in Cutchogue on the North Fork of Long Island, which was just beginning to emerge as the next big thing in Long Island real estate. Her success did not go unnoticed by the management team at Daniel Gale Sotheby’s International Realty, which had its own Manhasset office and was looking to expand to the North Fork. When O’Connell sold her agency to Daniel Gale Sotheby’s International Realty and joined its senior management team, she did it so that she and her agents could continue to succeed in a rapidly changing landscape. As part of the management team, O’Connell accepted the challenge to help regional manager Carol Tintle build Daniel Gale Sotheby’s International Realty’s presence on the North Fork of Long Island and other important markets, while taking charge of the organization’s Manhasset office. There were additional challenges as well, such as building allegiance to a new company and instituting a culture of collaboration. Under her leadership, the Manhasset office has grown in size and production, ranking as the No. 1 office in the organization for the last four years. A North Fork native, O’Connell was integral to Daniel Gale Sotheby’s International Realty’s East End expansion, which today includes offices in Mattituck, Cutchogue, Greenport, Shelter Island and the Hamptons. In her most recent executive position as general sales manager, O’Connell has been instrumental in the expansion of the organization west to Queens, south to Rockville Centre and east to Westhampton Beach. O’Connell is now spearheading monthly senior management meetings, as well as the monthly sales managers’ meetings. There is also a weekly teleconference for the senior management team. “The reality is that Pat, Deb Hauser, Tom Calabrese, Jim Retz and I speak just about every day,” she explains. “That way it feels more like a conversation than a formal meeting, and we can respond quickly to the needs of our customers and clients, sales associates and staff without it feeling like an event. For more information, please visit www.danielgale.com.